Imagine waking up on your first morning in Vegas, heading downstairs at 4.30am and into the casino, feeding $10 into the Britney Spears slot machine and turning it into $100 on your third spin. Heading back to your room via the wood-fired pizza ovens, stopping for the largest slice of pizza you ever did see before heading back up to your room for a 7 am Whisky tasting session. You couldn’t write it, could you? Well let me tell you, that was my first morning in Vegas. Having transported a bottle of Royal Salute in my suitcase from the UK to the USA in preparation for this ‘World’s First Virtual Whisky Tasting’ I set up my iPad and dialled into a Google Hangout. Joining Sandy Hyslop for the event, Royal Salute’s Master Blender. Sandy has been involved in the production of Whisky since 1983. Learning his trade in a small Whisky distillery on the East Coast of Scotland Sandy quickly gained a wealth of experience and was snapped up by Royal Salute as their Master Blender. In case you’re not familiar with the role of a Master Blender they have one of the most prestigious roles within the whole Whisky creation process. The moment the Whisky is distilled they check the flavours for quality. After being tested, it then goes into the inventory. Sandy is also responsible for purchasing the Whisky casks in which Royal Salute is distilled into. Since 1953, which is the year in which Royal Salute began to distil, the method has not changed. The casks are imported from Spain and have a specially blended Sherry condition them for 18 months before they’re fit for Royal Salute to aged in. The casks’ lifespan is three uses, with Royal Salute usually aged for 21 years this means the casks can be up to 63 years old before they’re retired. Royal Salute is steeped in a rich and solid history, the distillery was founded in 1801 by the Chivas Brothers. However, it wasn’t until 1953, on the day of the Coronation of Queen Elizabeth II that Royal Salute was born. 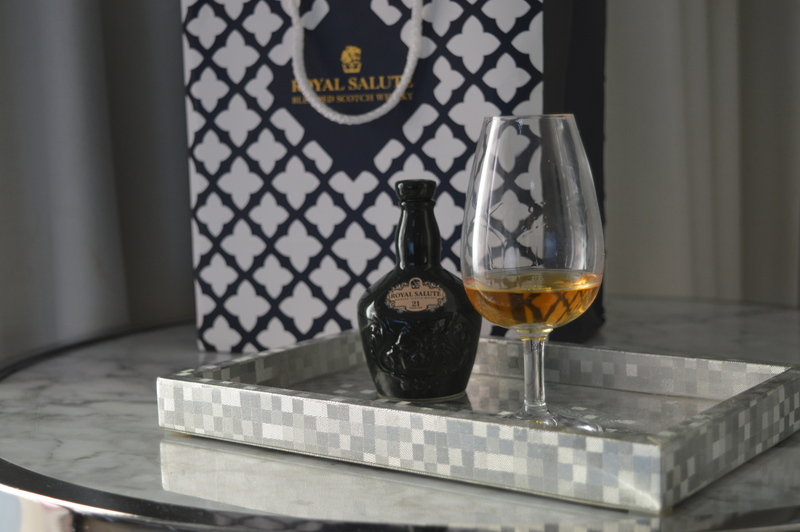 Named after the very traditional 21 gun salute, Royal Salute is aged for a minimum of 21 years. Expressed in porcelain flagons over a glass bottle. 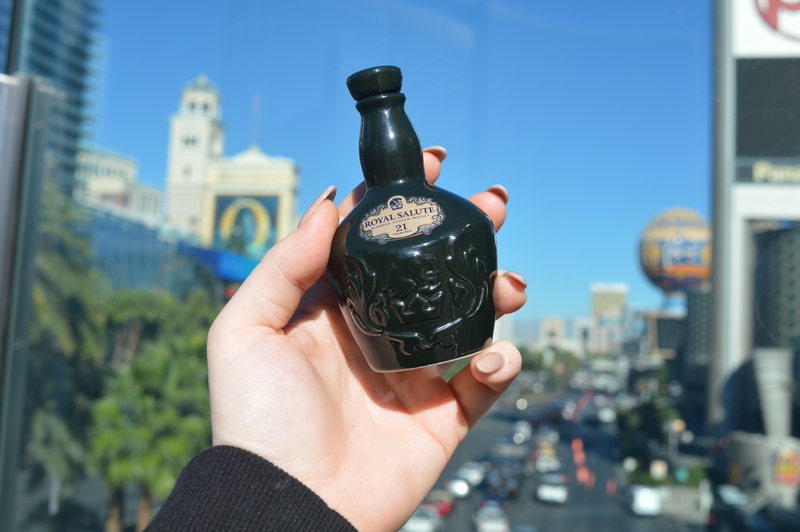 For no other reason than the luxury aesthetics of the decadent bottle. It makes for a great gift and an impressive ornament for showing off. For 2017, Royal Salute has launched the ultimate gift for the Whisky lover in your life. Featuring a miniature and full sized bottle of the 21-year-old expression in a beautiful laser cut box. In collaboration with designer and wallpaper creator Angela Groundwater. Entitled ‘Regent’s Banquet’ it really is the ultimate showstopper. Designed in rich blues and golds the box compliment the porcelain bottles inside. This gift is true to the day it was issued on Coronation day and remains at the heart of the brand. Paying homage to ‘the legendary Regent’s Banquet of 1817’. Which was an elaborate affair hosted at Brighton’s Pavillion. Documented as having over 120 exotic dishes served during this indulgent feast. Which has been hailed as an opulent celebration. With the festive period being the ultimate celebration and indulgence. This limited edition set reflects just that. Bring in 2018 in style with a toast of Royal Salute 21 year old. I just hope Harry and Meghan are gifted this divine pack to commemorate their celebration just like the launch of Royal Salute did for his Grandmother’s celebration in 1953. The decadent box truly captures the splendour and magnificence of the Regent’s Banquet. With a design which both honours and reflects Royal Salute’s royal and steeped heritage. The ‘Regent’s Banquet’ festive gift pack retails at £160 and is available exclusively from Harvey Nichols here. 7 am in Vegas is never too early for a drink right? With Sandy showing us how to nose a Whisky properly we were able to pick up the; pear, vanilla, milk chocolate, toffee, ginger and cinnamon flavours packed perfectly into our ‘wee dram’. We poured one dram and nosed it neat (as well as tasting it) and then added water to a second dram. This was to enjoy a softer taste, which still had that smoke at the end for that longer finish. The insight into Whisky distilling is so interesting and if you’re looking for the ultimate festive gift for the Whisky lover in your life. Then make sure it’s the Regent’s Banquet 21-year Royal Salute!